Why will a customer end up choosing you instead of a competitor? It’s because your customer had a problem, and they believed your product or service would solve it. Websites are full of features, specifications, and technical details. But quite often they forget to tell readers what’s in it for them. 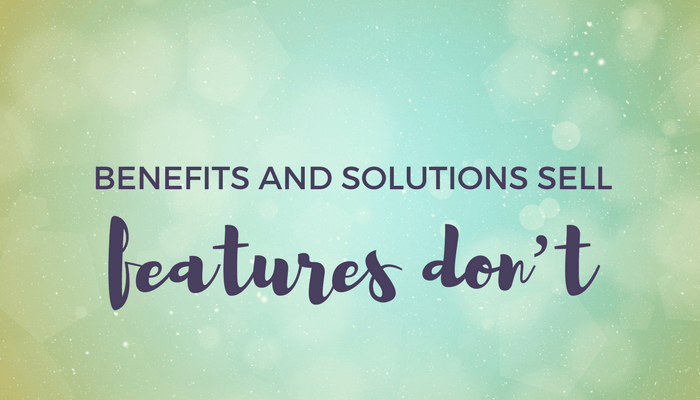 Features are the factual aspects of your offer and what makes it work. They tell your visitors what's included. But features aren't what entice customers to buy. That's where benefits come in. This is where the magic happens. Benefits are the results it creates for the customer and how your offer will improve your visitors' lives. It answers the question "What's in it for me?". What transformation does your product or service offer? What does it allow the customer to become that she isn’t today? Women don't buy Kate Spade handbags because they have a 4.75" handle and a 22" adjustable strap, or because they are made with crosshatched leather and a matching trim. They buy them to feel sophisticated, confident and gorgeous. For example, I offer WordPress support so you can have peace of mind and don’t have to worry about losing everything you’ve worked so hard to build. Be specific about your customers’ issues right there on your website. They’ll pay attention and stay on your site when they see that you understand exactly what they’re struggling with.